Amidst the time when the government is trying to suppress the voices of dissent, this book on Prof Bari will motivate you to fight against fascism. BeyondHeadlines editor Afroz Alam Sahil has penned down a book on Professor Abdul Bari, a forgotten hero who played an important role in the freedom struggle of India. 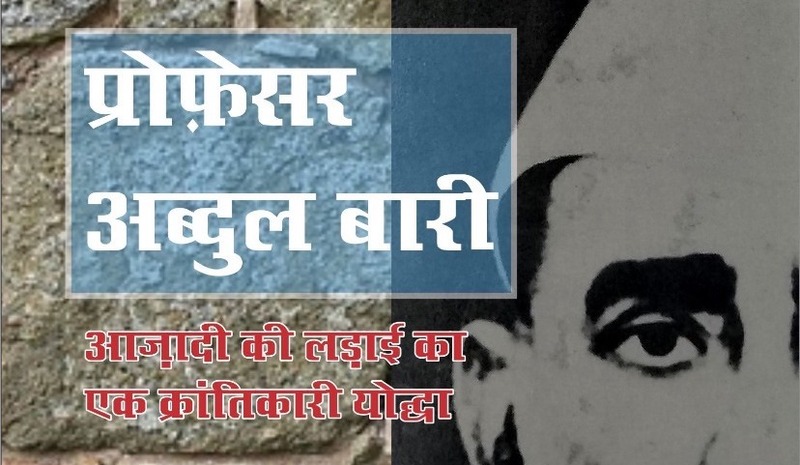 The Hindi book titled, ‘Professor Abdul Bari: Azaadi ki Ladaai ka ek Krantikaari Yodhha’ (Professor Abdul Bari: A Revolutionary Warrior of the Freedom Struggle) consists of 100 pages with 156 references. The author is well known for his research on Champaran movement and those makers of modern India whose names are missing on the pages of history. The book on Prof Bari by Afroz Sahil is a purely research-based work wherein the author does not give any of his opinions or conclusion on Abdul Bari or his contribution but has simply presented facts which remained completely unexplored. Prof Abdul Bari has remained a forgotten hero of the freedom struggle of India and whatever limited work is done on him, it tries to limit his role to merely a leader of the labour movement. This injustice has continued with all the heroes and revolutionaries who sacrificed their lives for the betterment of society and India at large. However, this book is an attempt at bringing back his identity not just as a leader of the labour movement but a prominent leader of the freedom struggle of India. The starting line of the book is ‘Writing history is a tough task, on that writing the history of a Professor of history who did not just learn and taught history but himself had created history, becomes even tougher’. The readers will know after reading the book that he was one of the most important personalities of Indian National Congress who criticised his own party when he found any faults in it. This is the speciality of Professor Bari, which we do not see in the current leaders of our country. Therefore, it is disheartening when one realises that his contribution is not at all discussed. The book gives you Goosebumps when you think over the details provided on the death mystery of this personality. Sahil only presents the facts in a well-ordered way and leaves it completely to the readers to decide whether his murder was a result of a sudden, unplanned altercation or a well-planned murder. It might have happened for the first time in the history of India that the murder of a personality having such importance is ignored completely. Once the reader finishes reading the book, the curiosity to read more about Prof Bari intensifies and here the author deserves appreciation. Every story and speech of Prof Bari presented in the book holds the attention of the reader to the book. Anyone can read the book in one go. Short and crisp, the book also leads to force the readers to think critically about the role of Gandhi and Indian National Congress in relation to Prof Abdul Bari. One of the reasons behind this being the details the author describes on page 19 that Gandhiji had clearly said that there is no politics behind Bari’s death, but Bihar’s first Prime Minister (Premium) Barrister Muhammad Yunus told that the statement was given in haste by Mahatma Gandhi. Barrister Yunus had also said that Professor Bari, three days before his death had told that he was going to reveal names of some important Congress leaders who were involved in Bihar carnage. The author promises its readers in the foreword of the book that this book will not be the last work on Prof Bari, he will write more on him. Let’s hope he throws some more light on the role of this powerful personality (who neither feared from colonial powers nor his own party members who were critical of his views and roles played by him, who stood in the middle of rioting crowd and dared them: p- 71), particularly on his murder mystery and his fears about Congress’s leaders becoming the kings of this country after independence. This book is read-worthy for all those common people of India who are fed up with capitalistic traits of the state and feel anguish about the disregard of the state on the question of employment. In the time when the government is trying to suppress the voices of dissent, this book on Prof Abdul Bari motivates its readers to fight against fascism. Amidst the crisis of minority representation, the young leaders of minority communities need to read this book on Prof Bari and analyse their possible political future.